The new generation of the IQ-Series Analyser shows – like its predecessor – the frequency range as peak, hold, RMS and energy curves. The energy curve shows the frequency range considering the time factor. In addition, innovative features like high resolution frequency analysis, simultaneous analysis of multiple live-signals in one display, continuous frequency zoom or the interaction with the IQ-Series EQ make the HOFA IQ-Series Analyser an indispensable tool for anyone who wants a capable partner for his ears. 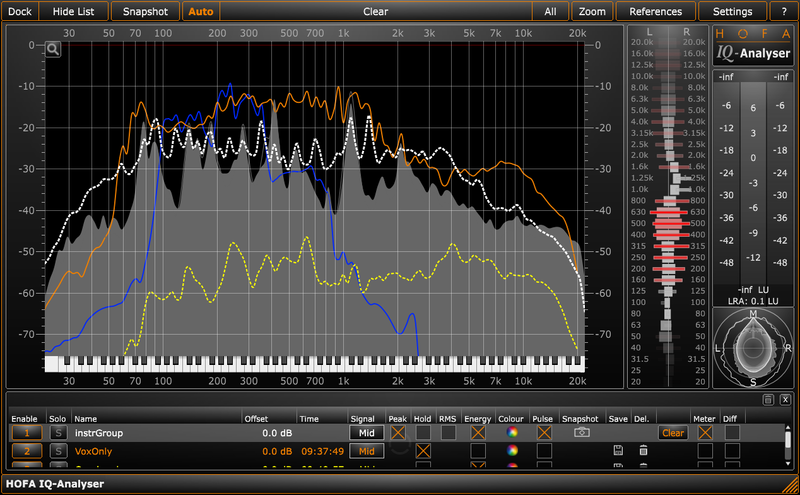 Reference curves from various styles of music are onboard and you can also create and save your own references. new in V2: high resolution analysis of the frequency range. new in V2: filter bank technology for 100 % precision (even at low frequencies!). new in V2: selectable display resolution (from high resolution to octave band). new in V2: simultaneous analysis of multiple live-signals. new in V2: shows multiple instances in one display (e.g.drums/instruments/vocals). new in V2: continuous frequency zoom with always 121 metering points in the selected range. new in V2: IQ-Series Analyser marks can be passed to IQ-Series EQ. new in V2: selectable input signal (mid, side, left, right). new in V2: twice as much reference curves for different styles of music. new in V2: management of references with sub folders. new in V2: optional auto clear on playback start. new in V2: changeable slope to allow showing pink or white noise as flat. new in V2: innovative 31 band frequency correlator. new in V2: meter only mode. direct analysis via drag & drop in Cubase and Nuendo (new in V2: Logic). direct analysis via drag & drop of .wav, .aif, .mp3, .flac, .ogg out of Explorer or Finder. analyser with peak, hold, RMS and energy curves. precise metering (peak, hold, EBU, LRA, RMS). individual reference curves can be generated. supports all common sample rates and works without latency. Support for PC and Mac, 32- and 64-bit DAWs. sophisticated sound analysis with the innovative curve list. balanced mixes and masterings – even if your monitoring situation is not optimal. perfect EQ and compressor settings with less temporal and technical effort. fast detection of the relevant points of the sound frequency quickly. better understanding of audio engineering – at the analysis of your mixes and. other productions a lot of issues will become much clearer. planned approach at recording, mixing and mastering by the use of high-precision frequencies- and volume indicators (also EBU-Scale). consistent quality at all your studio work – reference curves open up brand new control capabilities. better sounds even at live concerts because of its work without latency.